Agents from all over the world add their listings to ProxioPro, because it is a trusted site for agent-to-agent marketing and sharing. When you find a property of interest, you can contact the listing agent directly for more information, or translate and send a summary to your clients -- with just one click. Each agent decides how much information to share about each listing, making ProxioPro a perfect place to enter private listings, and to quietly market properties where discretion is paramount. For these reasons, you will find properties in ProxioPro’s gated agent community that are not advertised anywhere else. With one low subscription fee, you open the world. Start today! ProxioProThis is where REAL ESTATE PROFESSIONALS build a Global Network for business. SIGN UP NOW Join more than 600,000 Real Estate Professionals worldwide! Thanks to Proxio, I found an investor for my property, resulting in a $19 million sale for a commercial development project. I get leads from all over the world that I don’t get anywhere else. I absolutely love Proxio! Thank you for activating your Proxio account. For security reasons, we have emailed your login credentials to your email address on file. Please check your email for your credentials, and use them to log into your Proxio account. Please click below to create your free Proxio Connections account. Join Proxio Connections – It’s FREE! An unknown error occurred. Please verify your entry and try again. If the problem persists, please contact your system administrator. Sorry, we did not find a match. Try emails you use with your MLS or Broker accounts. We've sent you an email that will allow you to reset your password quickly and easily. Incorrect code entered. Click refresh to get new code. Agents from all over the world add their listings to ProxioPro, because it is a trusted site for agent-to-agent marketing and sharing. When you find a property of interest, you can contact the listing agent directly for more information, or translate and send a summary to your clients -- with just one click. Each agent decides how much information to share about each listing, making ProxioPro a perfect place to enter private listings, and to quietly market properties where discretion is paramount. For these reasons, you will find properties in ProxioPro’s gated agent community that are not advertised anywhere else. With one low subscription fee, you open the world. Start today! In ProxioPro, every agent can build a professional profile, containing their credentials , contact information, and links to their listings. When you need to find another real estate professional outside your area to assist a client, this is where you start – and it’s where they start to find you, too. Search by location, language, credentials, name, specialty or affiliation – find exactly the partner you need for your transaction. Your ProxioPro profile is an essential marketing tool, constantly available to referring agents across the street or across the globe, in the world’s most extensive real estate network. When you represent an outstanding property, you want to be sure to get the best sale price by making sure buyers from anywhere can see it. ProxioPro removes the barriers of geography and language, and allows you to promote properties with large images, multi-language descriptions and virtual tours – to please sellers and give you a competitive advantage. Agents from all over the world add their listings to ProxioPro, because it is a trusted site for agent-to-agent marketing and sharing. Each agent decides how much information to share about each listing, making ProxioPro a perfect place to enter private listings, and to quietly market properties where discretion is paramount. This is not a social network, this is a professional network. ProxioPro connects real estate professionals around the world who want to do business together – because they know that referral business is the best business. Market yourself and your listings to referring agents across the street or across the globe in the world’s most extensive real estate network . There is no faster way to increase your income than by working collaboratively with other agents who can market your property listings or send you clients. Connect with property professionals everywhere, or only with trusted associates – it’s your choice. Take full advantage of the Internet to market the properties you represent. Post your listings to Facebook, Point2, or other ProxioPro partner sites worldwide. All it takes is a few clicks! Listings can be posted in any ProxioPro language, and many are interactive – allowing consumers to choose their preferred language for viewing your listings. Never before has it been this easy to get the visibility you want to consumers worldwide. 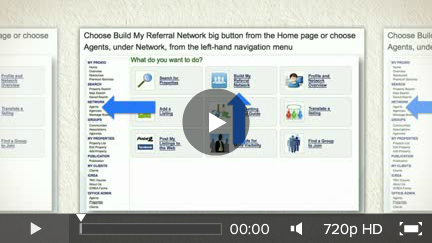 This is not a social network, this is a professional network, and it exists to help you grow your business. In ProxioPro you can make connections with groups of individuals who share an affinity, a specialty, a language, a focus… you decide. After you Connect, ProxioPro makes it easy to Communicate, with message boards and individual or group emailing, so networking is simplified and you get a good return on time invested. Market yourself and your listings to referring agents across the street or across the globe in the world’s most extensive real estate network. In today’s multicultural world, buyers could be from any country and could speak any language. With ProxioPro, it is easy to accommodate clients who prefer to view property information in their own language, using Proxio’s one-click translation tool. From English to Chinese, from French to Russian, from Portuguese to German or any other, ProxioPro removes barriers across continents and cultures. Proxio’s partnership with Global Property Guide gives you a one-click avenue to information about economic conditions in housing markets all over the world. Covering 120 countries, Global Property Guide is both a resource and a business tool for any agent with an international clientele. ProxioPro subscribers at the Platinum level can send their property listings directly to Global Property Guide, for additional high-end consumer exposure and traffic, with just a few clicks on the Proxio Publishing page.